Cook garlic and onion in 1T. olive oil. Meanwhile, cut chard stalks into 1" pieces, and cut leaves into pieces. Add stalks to garlic and onion and cook a minute or two, then add the rest of the chard leaves. Cook down until chard is wilted. If there is excess water, drain it out of the pan. In a bowl, beat 3 eggs, add 1/4 Cup cheese (or more if desired). 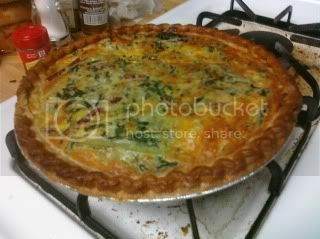 When chard is cooked, add to egg cheese mixture, stir, pour into pie shell. Top with Parmesan. Bake at 400 degrees for 30 minutes or until firm. Makes 8 slices.